It’s happened to most of us in fisheries field research, whether loading up the shock boat at a ramp, stopped at a gas station for tater wedges and bad coffee, or on the river when you run into someone who’s paying a guide to be there for nearly the same reason we’re there on the clock. I’ve seen a range of attitudes after this. Oddly enough, one of the more common responses is an uncomfortable mixture of resentment, cynicism, and anger that one could actually make a career of being on the water studying fish. We often find ourselves audience to someone who is irate that the government (or, for the last 5 years, Obama) would stoop so low as to pay scientists to study and work to conserve the very resource the indignant angler is enjoying. When they find out that we’re out there after “trash” fish or anything other than trout or bass, it’s usually too late for a positive outcome to the conversation. Sometimes, though, we’re lucky enough to be approached by someone who is genuinely interested in our work and open to a dockside education on habitat conservation and species diversity. And just often enough to keep our spirits up is the citizen who is so enthusiastic about it that they hang around to watch or even volunteer to help. Many of the people we meet in the field during work, regardless of their personal attitude towards us, have a general ignorance about what our work as fisheries field scientists actually is and why we do it. 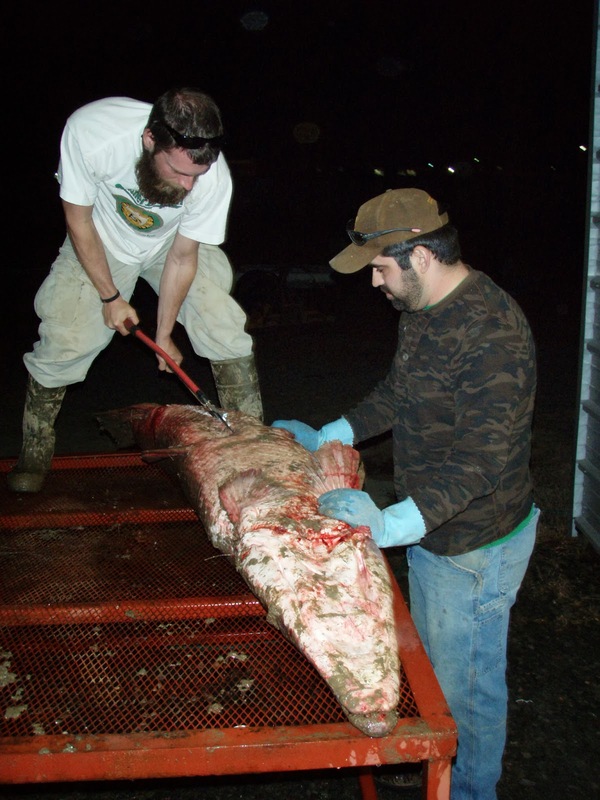 It’s more likely to find a fisheries biologist pulling a seine through a muddy farm ditch with 95-degree water. Photo: Lindsey Lewis, US Fish and Wildlife Service. At a recent departmental social, I introduced myself to the mostly wildlife (non-fish) group as a “professional fish bum.” It struck me as the most accurate title for myself now, as I’ve taken the last year and some to step back in my salary and career to work as a field and lab technician, mostly assisting graduate students with their studies. I’ve been all over Colorado and more, from the trickly plains streams full of cowpies to big desert gorges to alpine streams to tribal land in the Grand Canyon. It’s the kind of work that draws in most field biologists early and keeps us around later on. The work is exciting, rewarding in the short term, and keeps you traveling and working hard outside. Most of us start out because we grew up fishing, hunting, camping, or otherwise getting an intimate practical education in nature. Taking a summer field job fresh out of high school is a good way to get to continue that uninterrupted. At a personal level, I think many of us fish squeezers are generally happier in our jobs than the average person since we’re not always working for the weekend. The line between our recreational time and work is fuzzier than for most careers. It’s not uncommon for us to finish the last site of the day and break out the rods and fish for a few extra hours before heading home or throw on the mask and snorkel and look for madtoms. Camping on wilderness gravel bars comes with the contract. Somewhere along the line, though, we start to understand and care about the resources, the habitat, and the species. Maybe it’s in school where a professor points out how rapidly fish populations worldwide are declining. Maybe it’s witnessing the aftermath of an irresponsibly managed bowfishing tournament or seeing our favorite smallmouth stream being gradually silted in by a gravel mine. At some point, we realize that to keep our streams and lakes healthy, it takes not just knowledge, but the special kind of love that we have to protect our water for the rest of the world. Anyone has the capacity to learn and understand why humans and all other animals depend on rivers and streams. It’s a different type that takes on a low-paying jobs and the Sisyphean career of trying to protect fish and their habitats for their own sake as well as ours. So to those of you we meet at the river that encourage us and want to learn, we do it for you. And to those of you who think government money would be better spent putting more trout in the river, we do it for you too. On the days you don’t see us, we may be slogging around in wastewater effluent at your local treatment plant or doing necropsies on a thousand rotten shad that inexplicably died yesterday. 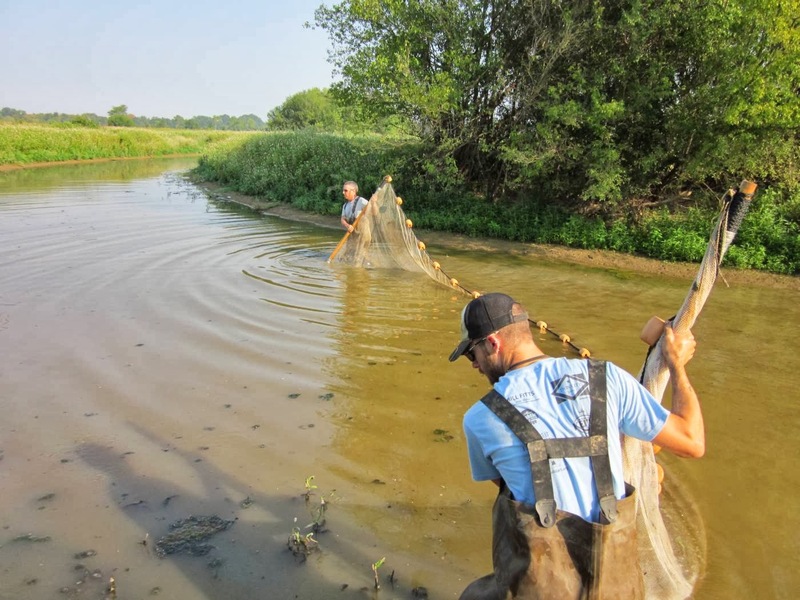 We may be on all fours in a cottonmouth-infested farm ditch getting rid of invasive species that threaten native sunfish or pulling in hoop nets full of irate snapping turtles. On some days, it is getting paid to run whitewater and go fishing. But every day, it’s work that we chose because we have the desire to take care of a resource that’s precious to everyone. 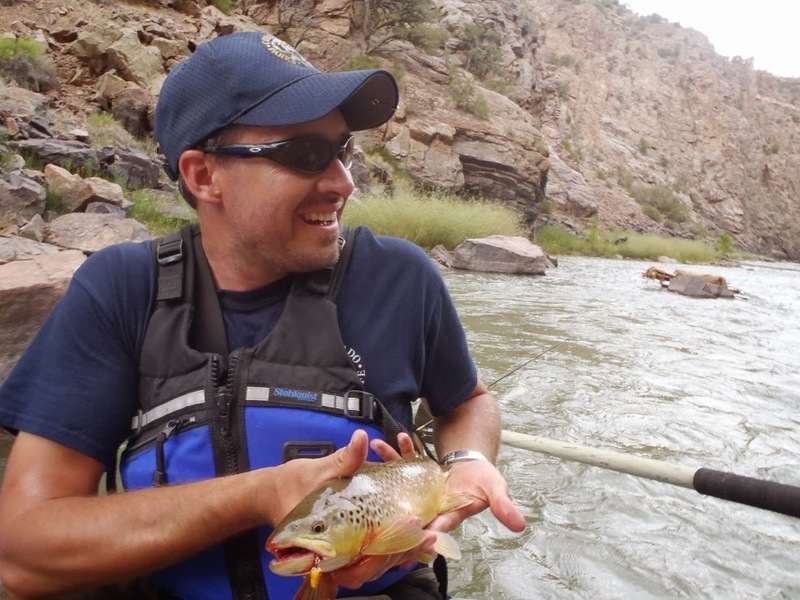 Ed Kluender (kluender@rams.colostate.edu) is a research associate in the USGS Cooperative Fish and Wildlife Research Unit at Colorado State University. Be sure to like The Fisheries Blog on Facebook and follow us on Twitter (@FisheriesBlog). Also, be sure to enter your email at the top right of this page to to have us email you our weekly article. right of this page to have us email you our weekly article. Previous Post When the quick cure causes long-term danger: Who knew antibiotics could be such a problem? Cool article. One difference I have had in my experience (mostly in Ohio and Virginia) has been mostly positive interactions with folks on the river banks. 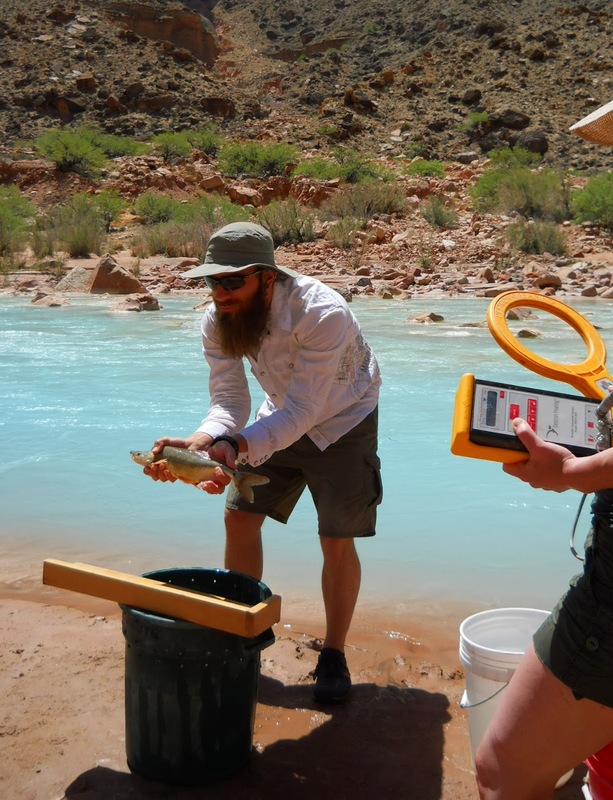 In particular, people in Virginia usually seemed excited to have researchers from Tech zapping fish in their creeks, so long as you could also talk about Hokie football. So the (two part) question I have is how much regional differences are there in public attitudes towards conservation and how much difference does it make if you are a university researcher vs. some state or federal agency? Having worked in the field both for agencies and for universities, I think agency personnel are approached with more preconceived ideas than are academic researchers. And yes, there are definitely regional differences, a lot of which you could accurately predict based on politics, socioeconomics, or a lot of other things that might describe the general local attitude toward conservation work. During my MS work, I met a lot more people that were genuinely interested in the research questions. I ran into a lot of farmers and commercial fishermen, and they all would express the same interests in how the issues I was studying affected them, but without any of the preemptive defensiveness that people often take toward a uniform and a truck with an emblem. A lot of the same people were very willing to help me in return and give me tips and knowledge that proved useful. In more conservative areas, or areas where people know that natural resource agencies could affect their livelihood (oil and gas extraction areas, farming, mining, sensitive species areas, etc), I've been approached with guard up. As you hinted at, shocking fish is a great equalizer regardless of your affiliation. Any time you have a big bucket of fish to show people, it helps distract from any perceived threat and you can all enjoy the river together for a little while. I've never seen anyone hold onto a negative attitude when you pull out a handful of darters or suckers or other fish they've never seen from their favorite fishing hole. Great article! I wrote a similar piece (http://dnr.wi.gov/wnrmag/2013/08/choosing.htm) about the numerous questions that I received during my undergraduate and graduate studies questioning my motivation for getting into biology and natural resources (i.e., fisheries). Looks like a wonderful job and very rewarding! Hi there! Thank you for posting this. It's such a great read, I enjoyed your blog. Keep it up! Great post. I've also had a range of experiences when approached by non-fisheries professionals.Happily, most of my expereinces have been very positive. I try to be as excited and honest as possible when someone asks a question, so it's pretty hard to be frosty. Also, I try to entirely abandon the idea of “the public”. I'm public too, am I not? For me, these strategies usually mean I can inform some interested on-lookers about why we do the work we do. Thats cool! while youre fishing they’re paying you for doing it. Looks dangerous but an exciting adventure and activity. That must be a tough job! I really enjoyed this post. You describe this topic very well. I really enjoy reading your blog. Here we have Shirts, masks, hats and decals for the fun-loving angler. Whether you fancy fresh or saltwater this performance fishing gear is up for the challenge. Excellent one piece of fishing research I found in your article I am a passionate fishing lover. Your experience will enrich my fishing journey. I wish to get some article about fishing gear and other accessories. Special Thanks for sharing this awesome post. keep continuing.